This week comes news that Target is laying off 1,700 workers at its Minneapolis headquarters, looking to become leaner and more efficient. It’s just the latest move in a shifting retail landscape in the United States. Target is not just downsizing its headquarters, it’s shifting to smaller urban stores–Target Express. Other retailers like Walmart and Office Depot have have also been developing smaller stores. The days of big boxes and power centers seem to be giving way to to more urban-centered and smaller-footprint retailing, undermining the economics of larger-scale retailing. It’s estimated that there are over 1,200 dead or dying malls in the U.S. 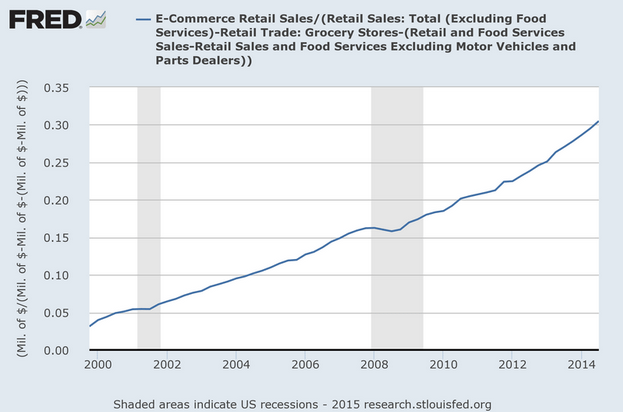 It appears that we’re way overbuilt for retail space. Finding productive uses for these disused spaces is now a major undertaking for communities around the nation. Several factors seem to be driving the tectonic shifts in retailing. Part of the problem is that retail, like housing,was overbuilt during the bubble: commercial developers typically followed new housing development, and as the housing stock sprawled in the last decade, so too did the expansion of retail space. There’s a bit of irony here: big box stores only become economically feasible thanks to earlier technological advances, including universal product codes, computerized inventory management, real-time ordering, and global data networks. These same technologies now help enable smaller stores (tailoring inventory to localized demand) and empower consumers to order online at home and via pervasive mobile devices. To judge who’s most likely to be affected by these trends, we compiled some metropolitan level data on the amount of retail space per capita. The data come from Co-Star, a private firm that tracks retail space leasing throughout the nation. (They helpfully make their market reports available here). These data are for 2007 and we’ve computed retail space per capita in each market by dividing total square footage by each metropolitan area’s 2007 population. The national average is about 46 square feet of retail space per capita, with most metropolitan areas having between 40 and 55 square feet per capita. There are a number of outliers, however. Milwaukee/Madison has the highest amount of retail space per capita, and many southern, sprawled metros rank higher on this metric as well. These are the places most likely to struggle with a dwindling appetite for retail space, and the economic consequences that follow, be it in fewer retail jobs, large swathes of unused space, or transportation costs. At the other end of the spectrum, some metropolitan areas have far more space-efficient retailing: Portland has just 30 square feet of retail space per capita, fully one-third less than the national average. By global standards, the U.S. has much more space devoted to retailing than anyone else: comparable estimates for other countries include: 23 square feet per capita in the United Kingdom, 13 square feet per capita in Canada, and 6.5 square feet per capita in Australia. If the experience of these countries is any indication, it’s a good bet that there’s lots there’s still lots of room for downsizing in the U.S. retail sector. However, despite these trends, Miami apparently isn’t concerned.